Everyone knows that the Swiss love to hike, but did you know that Switzerland is also a biking nation? That’s right! There are 17 Swiss bicycle manufacturers and some 4 million registered bikes, which is one bike for every two inhabitants. 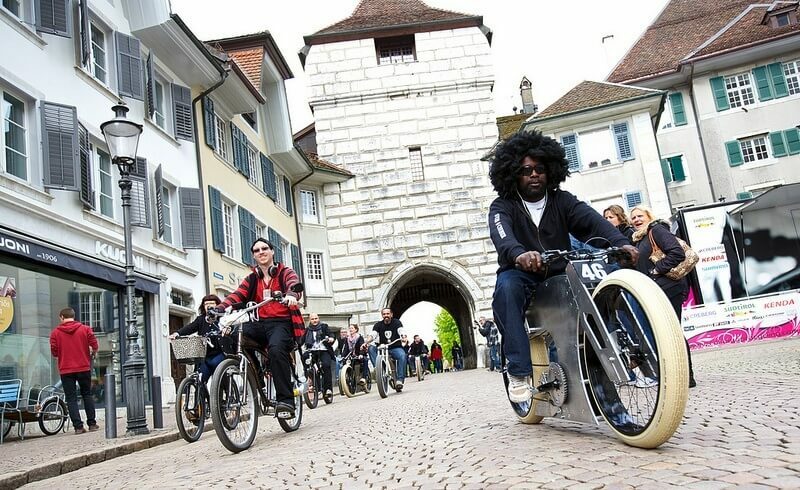 Every May, Swiss bike fans can go to Solothurn to celebrate Bike Days. During the three day festival, visitors are spoilt with choices related to bicycle culture: From races to product testing, as well as workshops on maintenance and biking techniques. Along with races in the city, including the famous Öufi-Cup (öufi being Solothurn dialect for eleven), there is also a mini cyclodrome to test race bikes and Fixie bikes. On Saturday, there is a mountain bike dirt jump competition. If speed, jumps and dirt are not your thing, you might like to test a Flyer electric bike! The 2013 Solothurn Bike Days run until Sunday, May 5, at 6 PM.